There’s a sweet, heartwarming side to the arduous task of preparing the government of India’s annual budget. 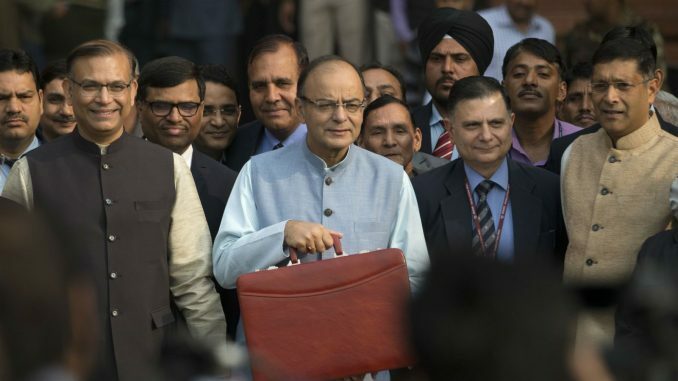 The printing of the budget documents, which set the country’s economic course over the next financial year, is carried out in top secrecy at the North Block, a colonial-era, red-sandstone building in the national capital, which houses India’s finance ministry. It involves officials from the finance ministry remaining cooped up in the basement with absolutely no contact with the outside world till the task is completed. They emerge only after the finance minister concludes his budget speech in parliament. They emerge only after the finance minister concludes his budget speech in parliament. And in truly Indian fashion, the process is flagged off with some dessert. This year, the 100-odd officials tasked with the printing have been at it since Jan. 20, when they were treated to some halwa, ceremonially prepared every year specifically for the event. The halwa is a kind of sweet pudding that comes in a variety of flavours and textures. Following tradition, finance minister Arun Jaitley himself served them bowls full of the preparation at North Block. This ceremony is also a chance for the officials to share some light moments with the finance minister before getting on to the exhausting task. In the 10 days of peak New Delhi winter, between the halwa ceremony and budget day, they will remain confined to the budget press. The officials, primarily from the budget division, along with some from the law ministry, have little time to spare during that period, and spend most of it legally vetting and printing various sections of the annual budget. Typically, the expenditures budget is the first document to be prepared, followed by the revenue statements and budget proposals. The minister’s speech goes last, usually at midnight before the budget day. While speculation over Jaitley’s proposals is rife, confidentiality remains key to avoid information asymmetry between various stakeholders of the economy. All the more this year given the economic uncertainty in the air in the aftermath of demonetisation and introduction of the goods and services tax. Besides, India will elect a new government in 2019, making the upcoming budget for the 2018-19 financial year politically critical. In any case, measures to maintain secrecy are taken all through the roughly four-month budgetary exercise. It begins with the ministry holding consultations and seeking proposals from various ministries and sections of society. The budget division then works out an expenditure framework. This is further refined once a clearer picture of the government’s revenues emerges, usually around mid-January. The final number crunching happens in the fortnight before presentation, when the printing process is already underway. Meanwhile, two months ahead of D-day, journalists, otherwise ubiquitous along the corridors of power, are barred from the premises. A handful of persistent ones, though, can still be found hanging around outside. During the lockdown, the security reaches heightened levels of paranoia—barring senior officials overseeing the process, just no one moves in or out of the press. “No way!” an official responded, when Quartz asked if they are allowed to use cellphones, at least during emergencies. “Any phone call has to be made under the strict supervision of officials from the Intelligence Bureau (IB),” the official said, referring to India’s internal intelligence agency. Internet access, of course, is restricted, too, to avoid cyber-threats. While all this may seem a bit over the top, things were not always this dramatic. At the centre of it all is a little blue sheet of paper containing the most crucial figures, including key expenditure, the most significant budget proposals, and the fiscal deficit target. The “blue sheet” strictly remains with the joint-secretary of the budget division, the person in-charge of the process. While all this may seem a bit over the top, things were not always this dramatic. The current protocol set in after key papers were leaked in 1950. Printed in the Rashtrapati Bhawan (the presidential palace in the heart of the capital) till then, the process was shifted to the North Block only in 1980. On Feb. 01, Jaitley will present his last annual budget as finance minister of the current government. He must hope that the halwa he served the officials, in a way, serves the country well, too.